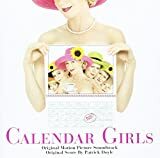 Accueil Produits Bande originale La bande originale de “Calendar Girls”. La bande originale de “Calendar Girls”. Sortie : 9 décembre 2003. I Find Your Love (par Beth Nielsen Chapman) – 2:28. Jerusalem (Knapley Women’s Club) – 2:09. One More Hour – 2:33. The Way You Do The Things You Do (par The Temptations) – 2:41. You Upset Me, Baby (par B.B. King) – 3:01. Comin’ Home Baby (par Quincy Jones & His Orchestra) – 2:48. Ride Your Pony (par The Meters) – 3:18. Find Another Way (par Mornin’ Norman) – 3:17.